Company Profile: Kraftly is India's first C2C mobile flea market for unique products, which so far have been available largely offline. 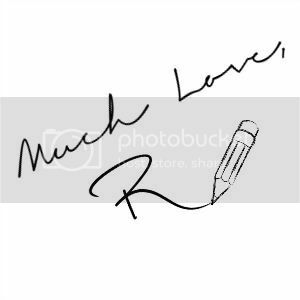 These items cover a wide range, including art, home & living, apparel, fashion accessories, costume jewelry, craft supplies, food, bath and beauty products, toys and other unique products. 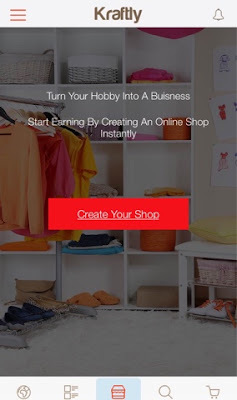 The app follows a model of an open marketplace which allows any seller – online or offline – to create their “microshop” in seconds and start selling. Buyers are able to discover unique products in a personalized manner and directly interact with sellers. To start with the application has a neat layout with an easy Facebook login option making the application very user friendly. 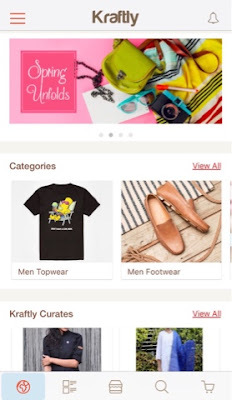 The home page of the application is divided into a couple of sections, at the top we have a varied display of items including the most popular items of the week. 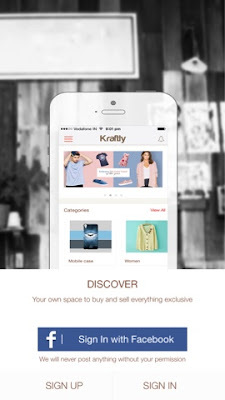 Everything that you think you need or you do need from this application is available on the home page as it contains options like categories, shops, kraftly curators, featured products, recommended products, most loved products, recently viewed products, sell with Kraftly. 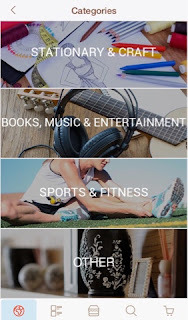 In the left hand side corner there is a tab that displays various features like discover, browse categories, sell, my likes, my credit, share with friends, rate us, FAQ, confact us, terms & conditions, Kraftly blog. Even the labels of all these categories available on the home page and in the tab section are to the point making the application really simple to understand and use. 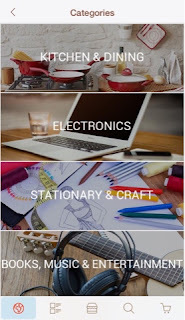 When you visit the categories section you can view the various options available in it like Women, Men, Baby & Kids, Home & Living, Kitchen & Dining, Electronics, Stationary & Craft, Books, Music & Entertainment, Sports & Fitness and Other. 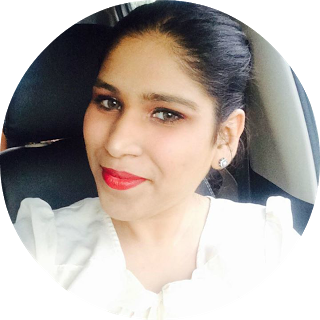 These categories further bifurcate into sub categories that you can sort and filter as per your choice depending on price, popularity, type of product, etc. 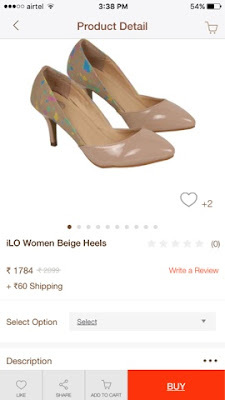 So when I wanted to search for beige pumps I tapped my way to Women - Footwear and then further selected the refine option to narrow it down to heels followed by sort by price. The refine and sort option made my task of finding these heels less complex and helped me save time. After you find the product that you would be interested in you can add it directly to the cart or select the like option and continue browsing to check out a few options and get your perfect product. 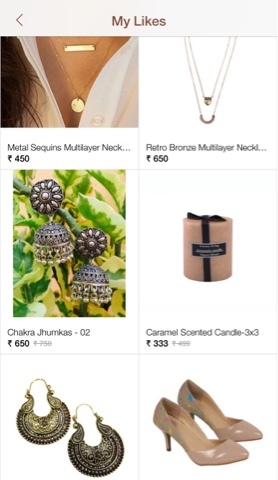 Another amazing feature about this app is you can create your own collection with the products you like online, also if you share these products on social media channels you will earn some extra credits in your account. 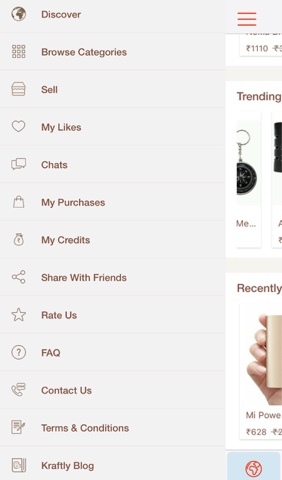 The application is also very useful for online sellers who can create their e-shop within minutes and free of cost. All you have to do is go to the sell section enroll your number (which will be kept private), shops name, email, shop address and shop details. 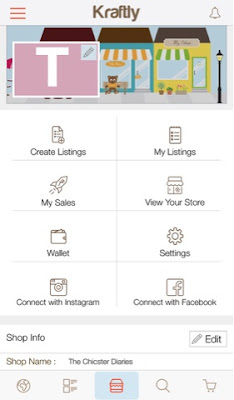 Once you have made your e-shop you can create your listings and you are good to go! Excluding this you can even connect your Instagram and Facebook account with your Kraftly account. By integrating your Instagram account with your Kraftly application you can make every post you make on Instagram shoppable. 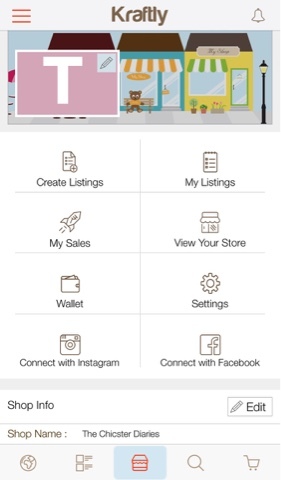 This application will auto post all the listings you make on your Instagram and Facebook page making your work a whole lot easier. 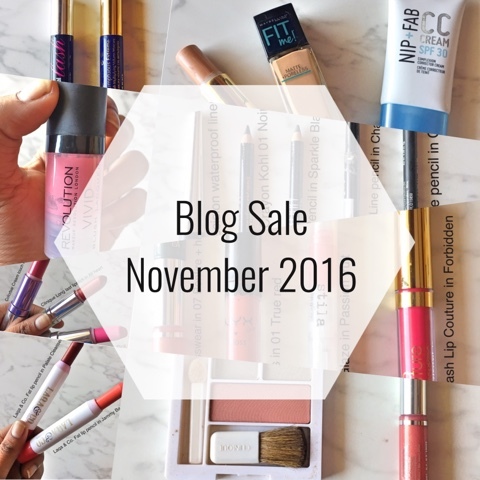 Hope you enjoyed my today's post? Do drop in a message in the comments section below and let me know if you have tried the Kraftly app? Also, would you be trying this application soon? Sound interesting. Will try out this app. This is a very interesting app. Will check it out. Selling online is a good option always. Thanks for sharing! They sure have a wide range of products. Thanks for sharing the app. Looks good! Never heard about this one! That's really cool! I don't think we have an app like that, here. I mean, we have an app for Amazon, which sells everything, but it looks quite ugly. Lol. 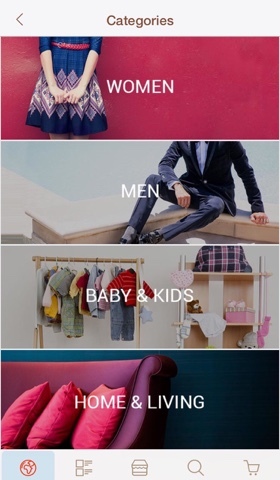 Your Kraftly app is way more aesthetically pleasing. Sounds wonderful for both shoppers and sellers.